Today’s letter is G for Gems, particularly Lyn’s Gems. What do you do with your old costume jewelry? Pieces that are older than 20 years are considered to be vintage. I buy and sell vintage costume jewelry. I buy at auctions and estate sales. I re-sell these items on eBay under the name “Lynsgems”. I have been doing this since 2002. Today, there were more than 400,000 pieces listed on eBay under the category of “Jewelry & Watches/Vintage and Antique/Costume/Vintage-Retro/1930’-1980’s”. In the past 90 days over 200,000 pieces of vintage costume jewelry were sold on eBay. Old,real,Antique Amber necklace for Collection Wonderful piece! This particular item sold for over $17,000. So, hang onto those Baltic Amber beads you may have laying around. You can buy a piece of vintage jewelry on eBay for as low as one penny with free shipping! My most recent success was a pair of earrings that I picked up at an auction for $10.00 and sold them on eBay for $300.00. There are basic rules of thumb to determine the value of these gems. One of the first things I do is check out what is currently hot and selling on eBay. Jewelry that is marked with the designer’s or manufacturer’s logo usually makes a piece more desirable. Check the backs of your earrings, the clasps of your bracelets and necklaces for these logos. Even after my 12 years of experience with these gems, I still learn something new about them. 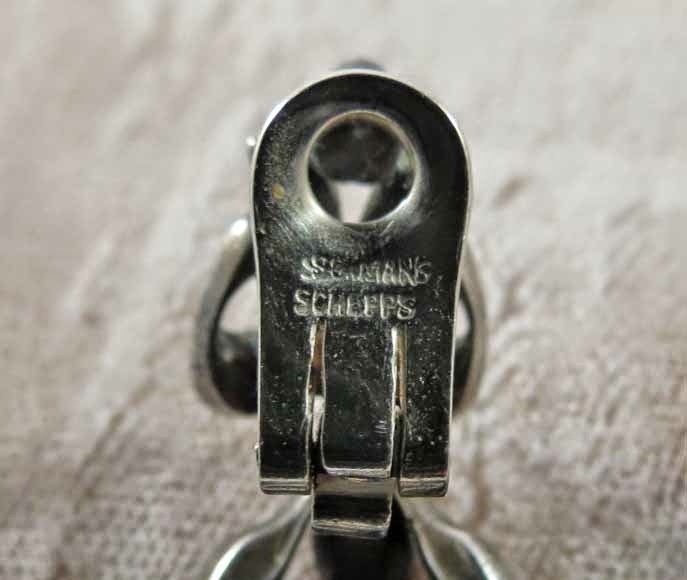 For instance at the time I bought these earrings, I was not familiar with the designer Seaman Schepps. I only learned of their value after I saw people starting to bid on my eBay auction for the earrings. I sure will be on the lookout in the future for pieces by this designer. It is also beneficial to be familiar with the lingo. I recently found out that mid century (1950’s-1960’s) items are referred to as BoHo for Bohemian or Hippie style jewelry. Plastic jewelry can sell for a lot of money. Of course bakelite maintains its value. But ordinary plastic or lucite items from the “50’s or 60’s can also bring the big bucks. Confetti Lucite is hot now. 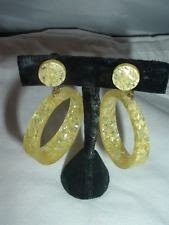 In January of this year, another fellow eBayer sold this pair of earrings for $140.50. The market can be fickle, though. What may be hot this year, will most likely be replaced by another trend next year. That is why keeping current with your research is the smartest way to judge whether or not you have a real Gem! Really interesting post. i inherited all my mothers jewelry...nothing very valuable, but I don't know what to do with it all. Maybe I should sort through it and post it online. There are really only a few pieces of sentimental value that I want to keep. There is a market for sure for your mom’s jewelry. Educate yourself about it. It’s really interesting. Interesting. I had no idea that costume jewelry could be so valuable. I stumbled on this quite by accident. It’s really only a hobby. But it has paid off for me. Thanks for stopping by. I appreciate that you are keeping my secret :). This fascinates me and reminds me of the enormous cabinet my grandmother had full of costume jewelry when I was a kid. I haven't been to her house in a long time--we are not in touch--but I often wonder if that cabinet still sits behind her chair in the living room as it always did. I love the old stuff. It was unique and well made. I guess I’m just attracted by shiny objects. Yes, absolutely take a look at it. But, it’s sweet that the kids get to play dress up. Beautiful earrings in the last photo, though everything here looks like a gem. Thank you for sharing, Lynda. Thanks for stopping by. I’m glad you enjoyed this post.